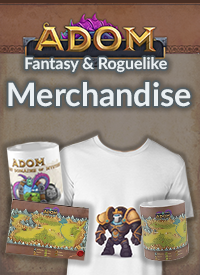 We have added so much stuff that our graphics wizards in Team ADOM are still hard at work with catching up. We are fed up with the long break and want to get feedback as soon as possible. As some features are still missing in the graphical version (or broken) we decided to put the ASCII version on the testing block. and hundreds of other major and minor changes. There probably will be crashes. Save files might get corrupted (although we haven't seen this so far). Or in other words: Here be dragons. Proceed at your own risk. The prerelease is available via the prerelease tester access. Follow the instructions and start playing as soon as possible :-) The change log can be found here (also as usual). Stabilize the ASCII version ASAP. In parallel add more unaddressed promises from the crowdfunding campaign. 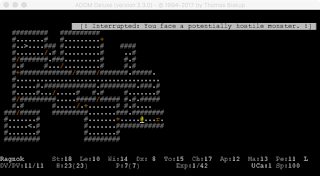 As soon as the ASCII version is stable, we will do at least one graphical prerelease for an equivalent feedback round on the graphical version. Then we will go to Steam beta with the prerelease. As soon as we know that the Steam beta is stable, we will make a public Steam release (including one of our front page lucky shots) to increase awareness. 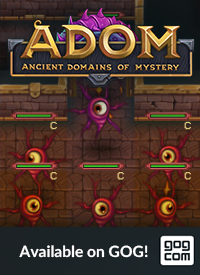 A major topic of our work for the past couple of months has been the simplification and enhancement of the UI - as a consequence it is a bit sad that you can't yet see all the fantastic changes in the NotEye/ADOM version. But we promise: the wait is worth it. IMHO the upcoming graphical release is spectacular. We have returned to the major.minor.patch level system. We still count releases but you now only can see the number with the 'v' command. This will allow us to do more branches in our GIT system so that we can have parallel development and bugfix branches. For the current version the 2.3.x branch will be used for bug fixes (with x > 1) and the next real big feature release branch will be 2.4.0. See ya soon with the next release! more icons, warning, indicators, etc. This is just terribly exciting! 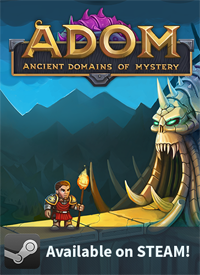 Hats off to team ADOM. Can't wait for the Steam release to drop. Massively good job, everyone! Well, the whole idea of that ending is based on something that will take a lot of effort, lot of luck, and basically yes, only maybe 0.01% of players will ever get to that point. And this (plus how cool this ending is) is what would make it very rewarding for such players. I didn't add the sad smile to express my irritation or something. The only reason was because i thought you totally forgot about it, didnt mention since 2013. Didn't mean anything bad, i love all the effort you put in the game, and if i could i would donate 50$ again. Idk much about programming, but i assume adding the special ending would take many workhours that could be spent on something more important. But to be honest, argument that something is irrelevant because only very few players will experience it sounds bad coming from a guy who loves to add so many details, content, etc, to his game that are uber hard to discover, require luck and tons of the game knowledge. Bottom line, you could just say something like "I have it in my mind, but we have much more important stuff to do now" instead of being rude for idk what reason. Niiiiice. Looking forward to Steam release.